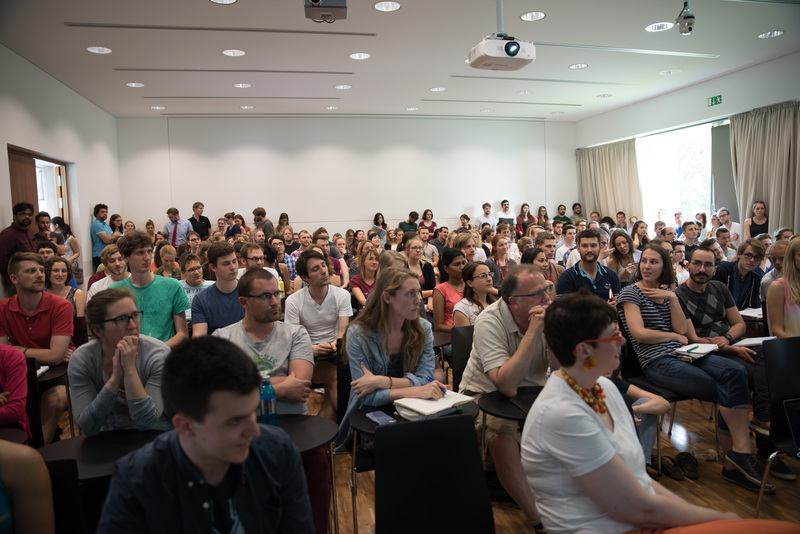 Opening science to a broad public is a major goal in iGEM. To integrate public opinions and concerns into the scientific process is increasingly important as new biological inventions could influence the humanity as a whole, the environment and our coexistence with nature. 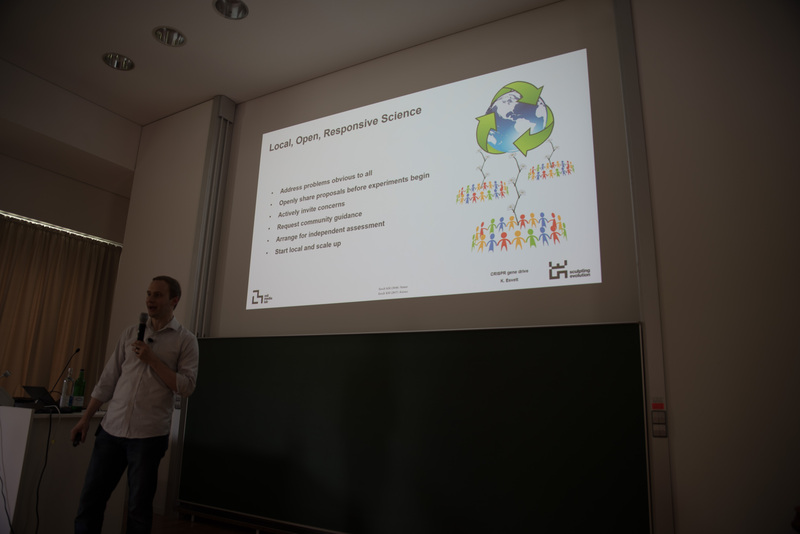 Therefore, we did not want to miss the opportunity to host Kevin Esvelt, the inventor of PACE (phage-assisted continuous evolution) and CRISPR-based gene drives, for an open lecture at our university. Kevin Esvelt presented his work on "Gene drive evolution, localization, and restoration". This highly intriguing topic and he, being the speaker, attracted more than 300 students and researchers with various different backgrounds. The concept of gene drives already exists in nature and allows particular genes to spread through populations even if those genes are not necessarily beneficial for an organism´s fitness. Kevin Esvelt and his colleagues mimicked this naturally occurring concept using the CRISPR/Cas technology, thereby enabling genetic alterations in sexually reproducing organisms to spread throughout populations. This way, new genes can be introduced into populations, e.g. to control reproduction of apopulation under specific circumstances. 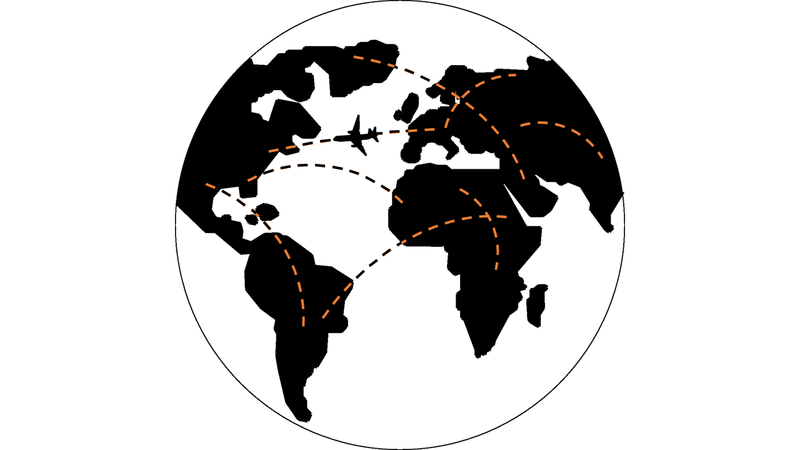 Consequently, applications of gene drives include preventing the spread of pathogen carrying insects like mosquitos transmitting malaria. As gene drives are a tool to bias inheritance of genes, the potential, enormous impact of releasing gene drive carrying organisms into nature raises major bioethical concerns. 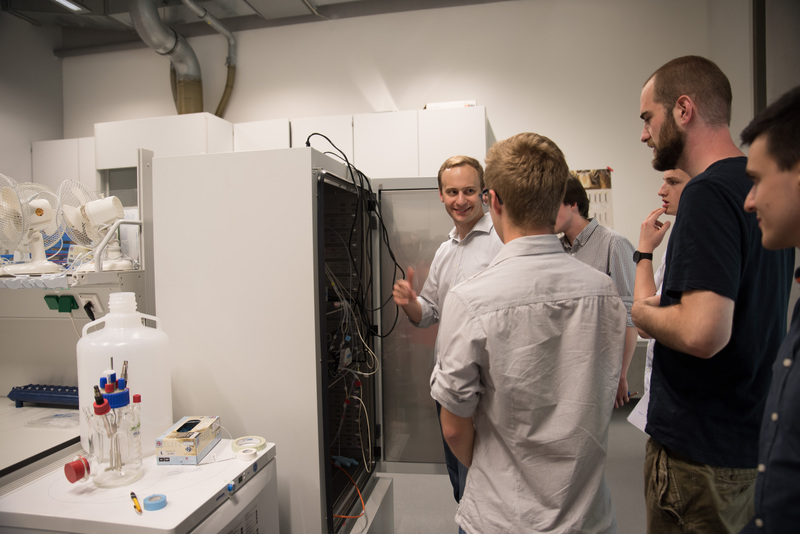 Therefore, Kevin Esvelt´s is continuously perusing an open dialog with the society about benefits and potential risks of scientific technologies before they are even started to be implemented in his lab. 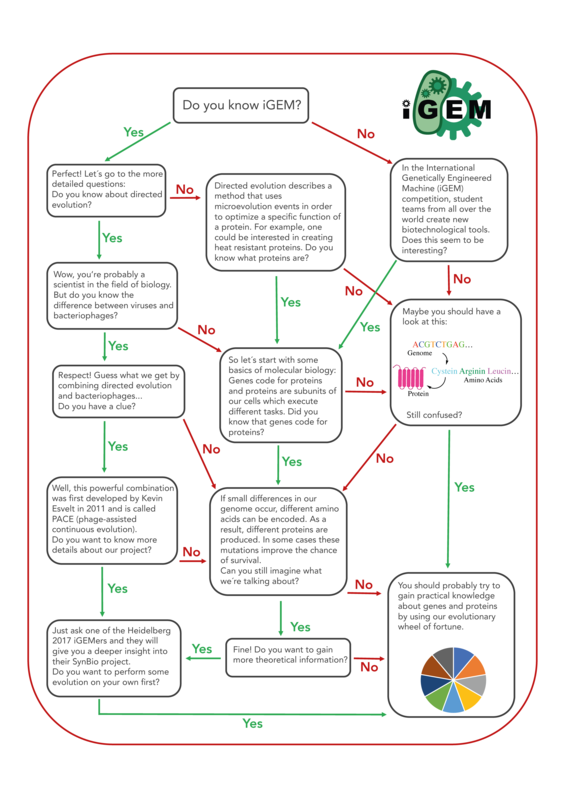 Notably, this aim of integrating the public opinion and discussion into the scientific process from the very beginning is also a hallmark of and key criterion for successful iGEM projects. By giving people a voice, they also get a choice. Emerging technologies may affect countries or even our planet as a whole and the broad public should have a voice in which way technology should be developed and how it is to be used. Besides CRISPR-based gene drives, Kevin Esvelt is also the inventor of PACE (phage-assisted continuous evolution), the method we want to build upon in our project. We were lucky to not only host Kevin Esvelt’s lecture at the BioQuant building, but even had the opportunity to actually show him our lab (which is located in BioQuant) and PACE apparatus and discuss our iGEM project. He provided extremely helpful advice not only on how to set up PACE technically, but also on how to design corresponding experiments safely and responsibly and how to communicate our project outside the scientific community. If you are interested in how we integrated Kevin Esvelt’s advice into our project design, please visit our Integrated Human Practices page. We are proud of having hosted Kevin Esvelt as a speaker and guest and are thankful for his inspiring input that shaped our project from its very beginning on. 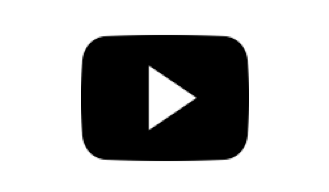 Watch Kevin Esvelt's lecture on youtube! 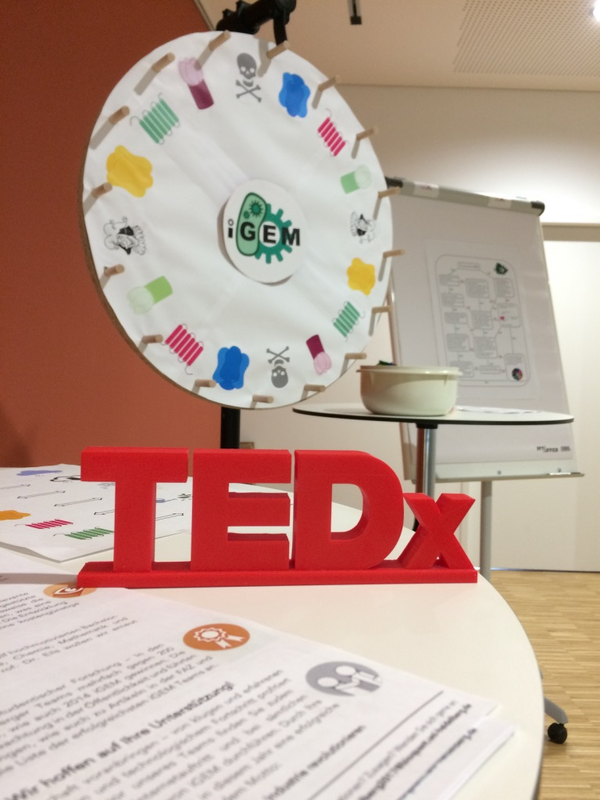 To get in touch with people from different backgrounds, we decided to present iGEM at the TEDx event in Heidelberg. 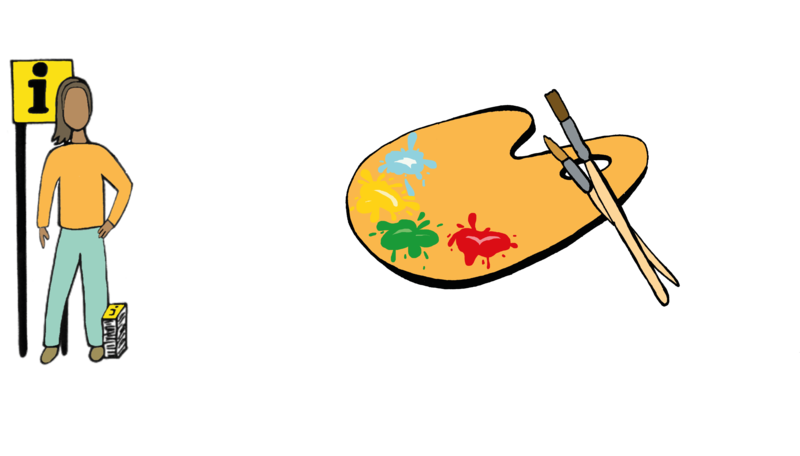 TED (Technology, Entertainment and Design) is a nonprofit organization providing a stage for "ideas worth spreading". 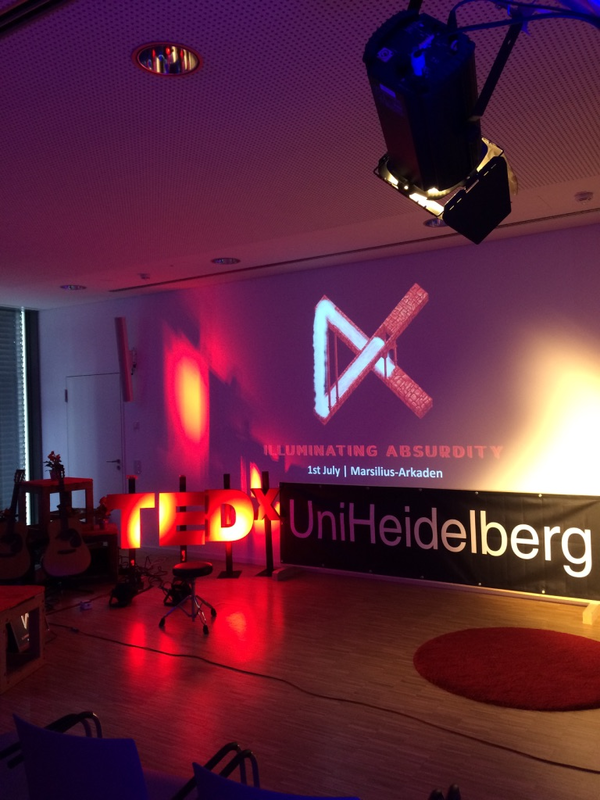 Short powerful talks give the audience an insight into a variety of topics and TED hosted renowned speakers like Jennifer Doudna, Stephen Hawking, Craig Venter, Steve Jobs, Bill Clinton and Lorenz Adlung. To illustrate how evolution is driving nature towards fascinating complexity, we presented an evolutionary game showcasing the causality between randomly occurring mutations and beneficial phenotypes under distinct environmental conditions. Playing the game, the conference attendees first had to roll a dice. The different sides of the dice thereby represented a specific environmental change or obstacle. For instance, a hot period, a drought or an ice age could come up, thereby causing a need for adaptation (selection pressure). Secondly, we created a wheel of evolution, each field on the wheel representing a single, potentially beneficial variation (mutant) of a protein. In other words, the wheel would represent the gene pool of a specific species. Players of our game could thereby experience how the interplay between random mutation and selection propels nature towards continuous adaptation and invention of novel functions. 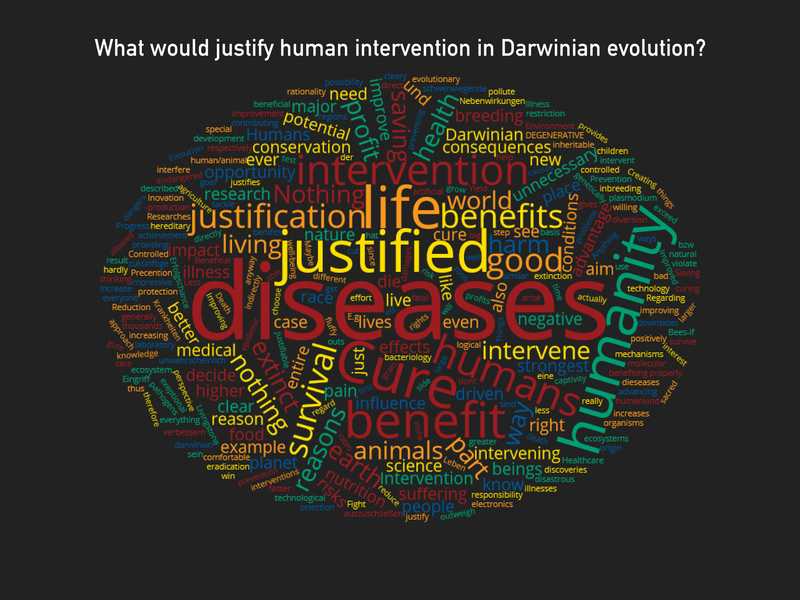 Thereby, our evolution game not only introduced the TEDx audience to the concept of Darwinian evolution. 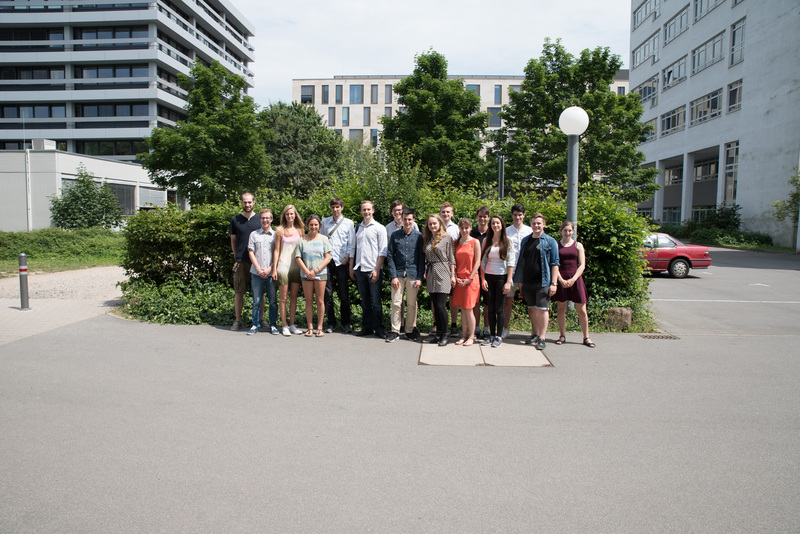 It served as starting point for further discussions about our iGEM project on in vivo directed evolution, as well as many other topics including the role of human in the reduction or even extinction of certain species (e.g. the bee population being dramatically reduced, likely due to chemicals used in agriculture), and genetically modified organisms in general. Inspiring conversations with people from various backgrounds offered us an insight into different perspectives towards our project. Surprisingly, the group of non-scientists rather unfamiliar with the details of Darwinian evolution beforehand was particularly excited about our iGEM project ideas once they had played our evolution game and started to think about evolution as a technology. 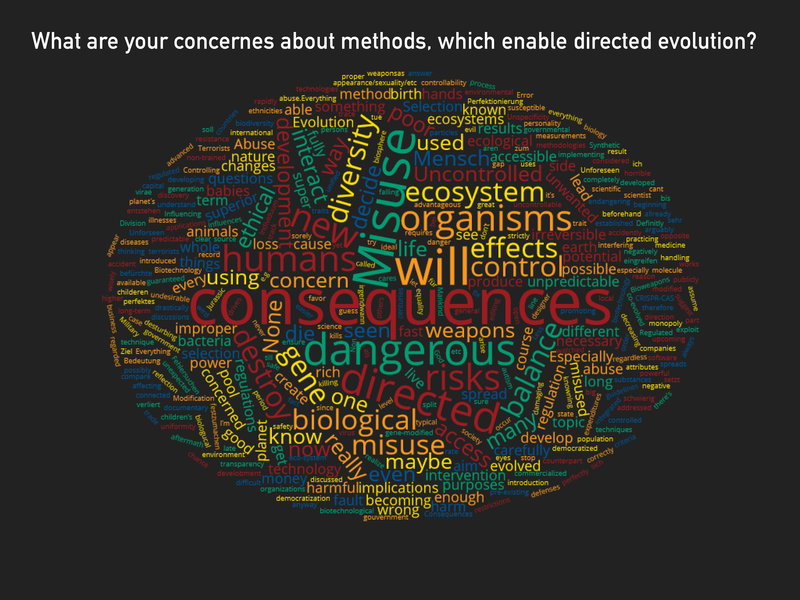 To receive productive feedback from the TEDx visitors we asked them to write down personal concerns, comments, and desires in context of our project idea and synthetic biology in general. We collected these statements anonymously in our "Synthetic Biology Box”. The very open feedback we received from the TEDx visitors shaped our project from the very beginning. For instance, one visitor noted, that we need to make sure our in vivo directional evolution approach (named PREDCEL for phage-related discontinuous evolution) was used responsibly and for the welfare of humanity. This feedback inspired us build our "Are you ready to PREDCEL?" question catalogue, which now represents the entry point to our toolbox and aims at stimulating a responsible as well as technically educated use of our in vivo directed evolution technology. Other TEDx visitors expressed concern that researchers might unintendedly evolve dangerous or hazardous proteins. This feedback inspired us to create SafetyNet, an online tool aiming to determine whether an input protein sequence would be safe to be used in PREDCEL. SafetyNet first performs a simple blast search and compares the results to a curated database of hazardous (e.g. pathogen-related, toxic or oncogenic) proteins. Then, SafetyNet uses artificial intelligence to infer “sleeping” hazardous potential in the input sequence, which could be accidently evoked during directed evolution in the lab. Hence, our SafetyNet enables researchers to easily test the safety of their evolution experiments prior to actually going to the lab. 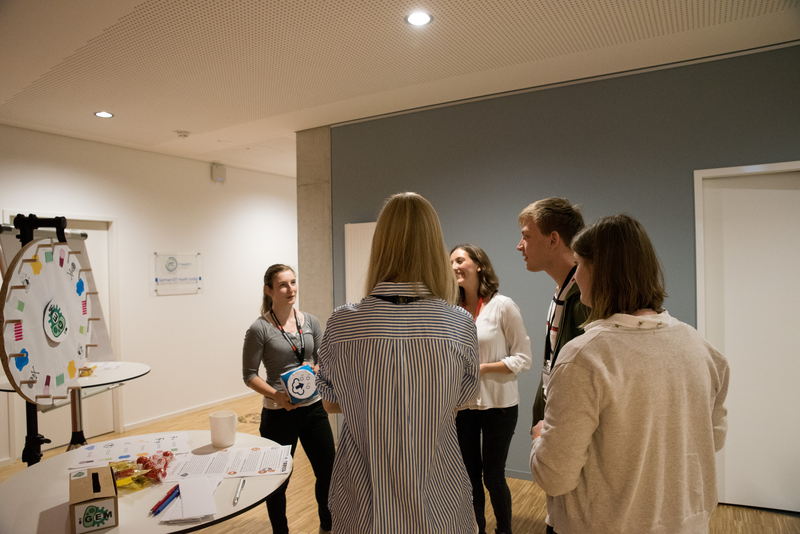 Overall, the evaluation of the anonymous TEDx visitor notes revealed that in particular the non‑scientists highly appreciated the opportunity to openly discuss a genetic engineering project prior to its actual implementation in the wet lab and to have a word in its design and setup. On the other hand, it was the open feedback by these people, that stimulated ideas on our side (SafetyNet, "Are you ready to PREDCEL?") on how to enable the responsible and safe use of our in vivo directed evolution methods by other iGEM teams as well as outside iGEM. 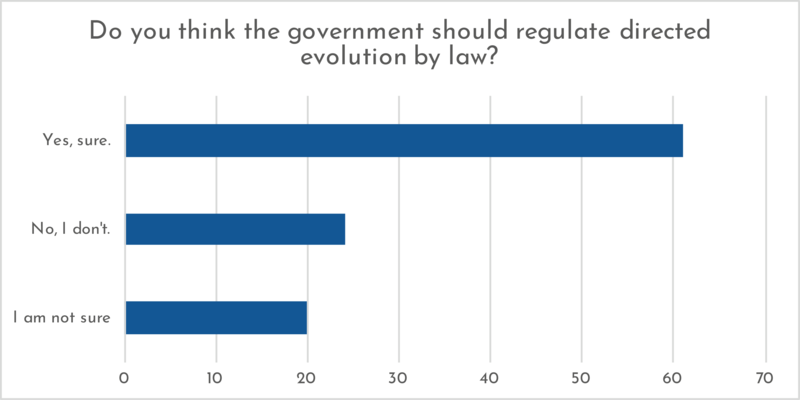 As we decided to pursue a directed evolution approach in our project, we wondered how the general public would perceive our research aim. Are there concerns that we could address in our project? Did we think about all the safety aspects of our project? Moreover, the combination of directed evolution and artificial intelligence is a novel and visionary approach in interdisciplinary research. How would the general public react to the combination of those two itself controversial subjects? 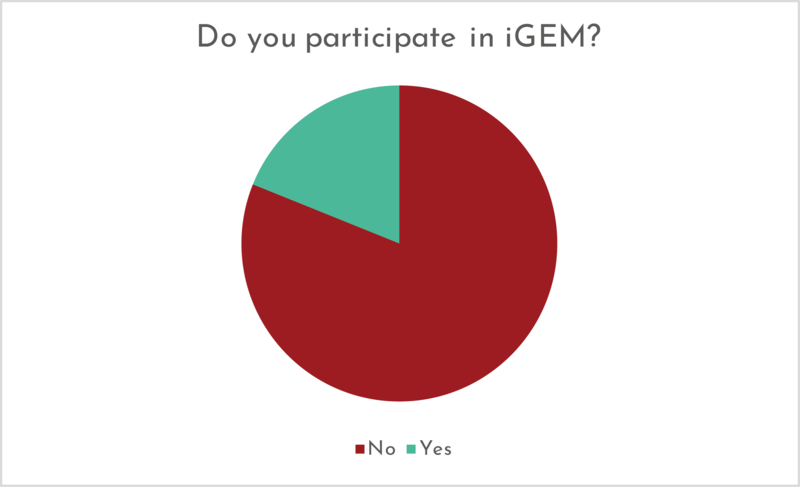 We created a survey to address these questions and advertised the questionnaire within the iGEM community, on social media platforms and the various open events that we organized. 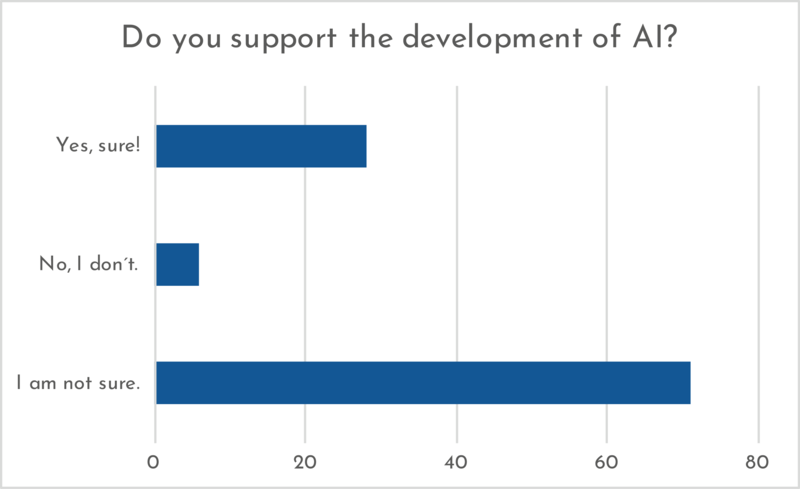 We reached over 100 participants at the age of 13 to 70 years, who filled in our survey. 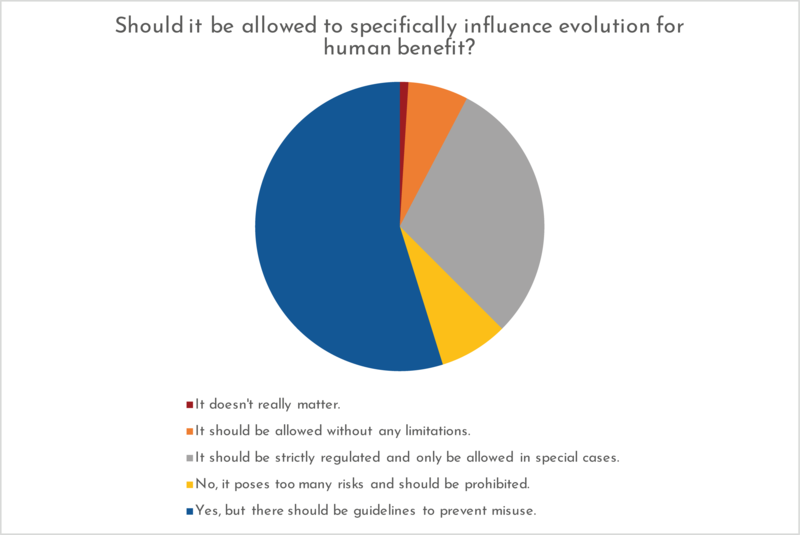 In general, the participants see and expect great benefits of directed evolution approaches. 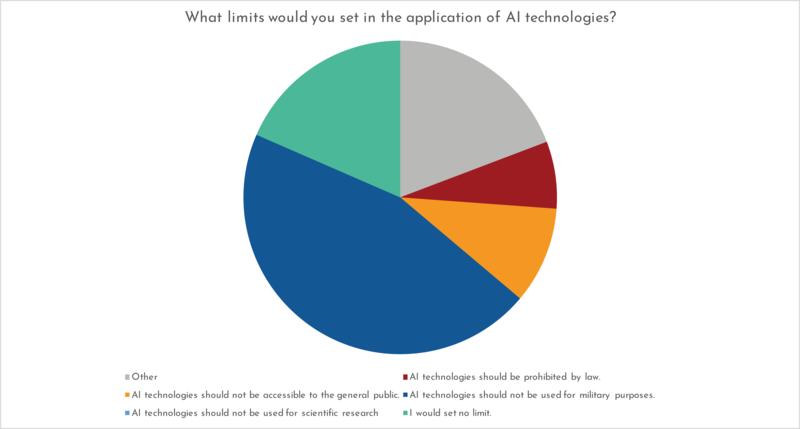 However, most of them feel the need of guidelines (55,7%) or strict regulations (29,2%) on such technologies in order to prevent intentional misuse or accidentally generated hazards. 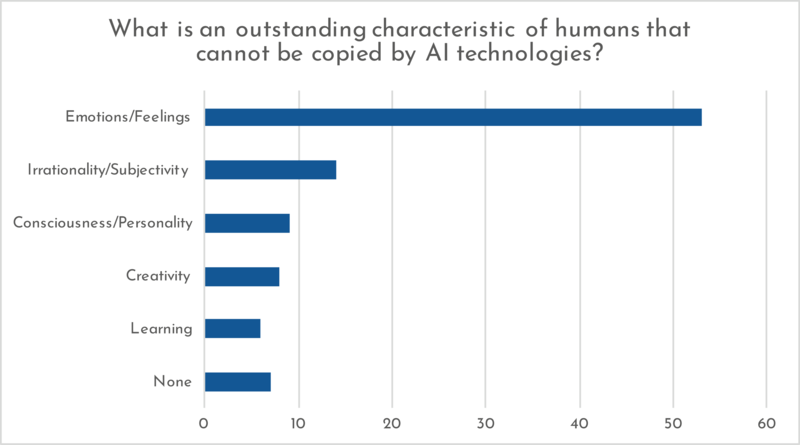 Our participants support the combination of directed evolution and artificial intelligence, as it reduces great costs for laboratory equipment and human resources. 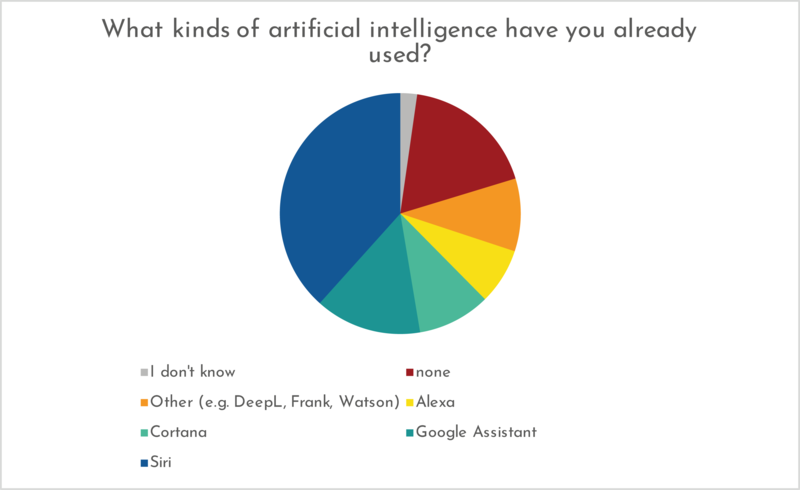 A large part of our participants support AI (67,9 %), whereas about one third (26,4%) is not sure whether to approve or disapprove of AI. With our project and the platform that iGEM offers, we hope to reach especially the people that are indecisive about the new biological advances and help them to reflect about their opinion. To address the concerns, which the participants of our survey and our team share, we developed our SafetyNet that calculates possible hazardous sequences that could evolve during PACE or PREDCEL. Furthermore, we created an "Are you ready to PREDCEL?" questionnaire that anyone interested in our toolbox has to fill in before it is open to use. We hope to urge our users to engage into critical thinking and to reflect on the possible consequences of their research. 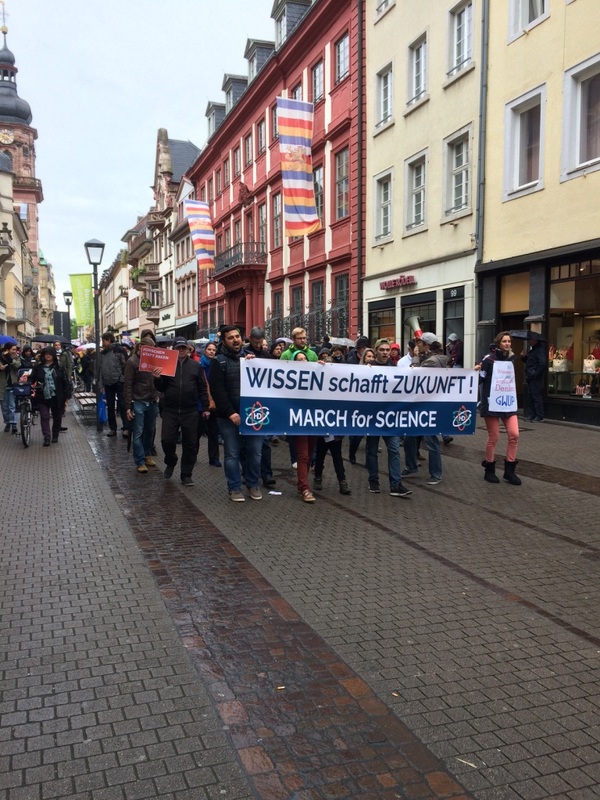 Supporting the March for Science movement we decided to attend the local demonstration for facts-based science and responsible use of scientific approaches. 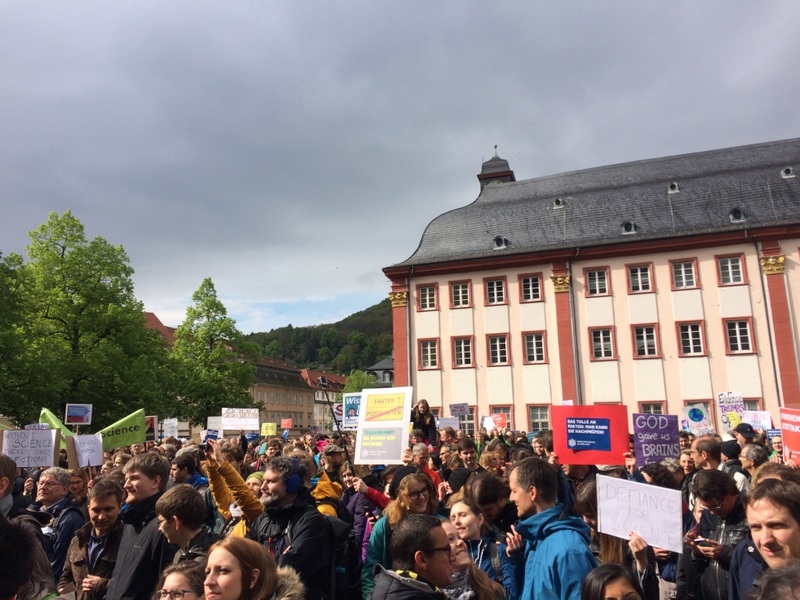 Hundreds of thousands scientists and science enthusiasts attended the this years´ March for Science on the 22nd of April.